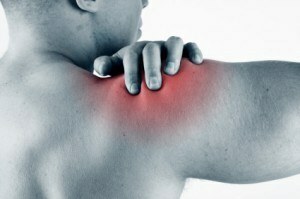 Pain in the shoulder is very common. The originating cause can be direct injury to the shoulder, irriation of the nerves in the neck that go to the shoulder, or poor posture putting pressure on the shoulder. When the shoulder does get injured, you may find you can’t lift your arm up over your head, or maybe that you have to help it over a certain part of the movement. Or it may just hurt doing certain activities. Often it will be aggravated by sleeping on your shoulder so you may want to sleep on the other side until it has healed. The most common problem in the shoulder is a ‘rotator cuff’ injury. The shoulder is a very flexible joint and so it stability is maintained dynamically by the ‘rotator cuff’ muscles under the control of the nervous system. The rotator cuff is a set of 4 muscles and their tendons that all insert into the top of your arm in your shoulder joint. You can injure the rotator cuff by falling onto an outstretched arm, twisting your shoulder unexpectedly or from over use. It can also get weakened and injured by pressure on the nerves on the neck that control the rotator cuff. Once the rotator cuff is injured, you use it less and it get weak so making it susceptible to yet further damage. A vicious circle. To avoid or reverse this situation, you may be given rotator cuff exercises to restore the activity and strength of the rotator cuff muscles. The acromio-clavicular or AC joint is at the end of your collar bone just inside your shoulder. This joint is commonly injured by falling on the point of your shoulder. When it heals, its common that there will be residual scar tissue that can pull and irritate around it. There are simple techniques to break up and normalize this scar tissue.